Hello dolls, we all know it's weekend again and we also know how exciting it gets whenever we have a beautiful and stylish look to slay in. You can only be sad during weekends if you are not a slayer, a fashion lover, a fashionista or a fashion person, Yay I said so! lol cos there is no feeling compared to the freedom we get during weekends to try out all those outfits and looks we have been fantasizing about, or we have seen somewhere and fallen effortlessly in love with and can't wait to rock it ourselves. 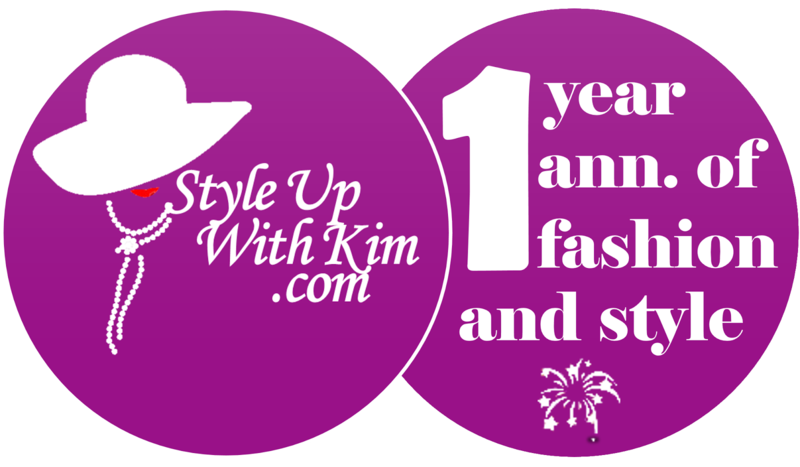 No wonder I am here to inspire you a bit with this post about the then and now trending denim on denim looks. Denim on denim fashion is one fashion statement and trend that I can't see leaving the fashion scene anytime soon, it has come to stay for a very long time. Besides it gets better each day! 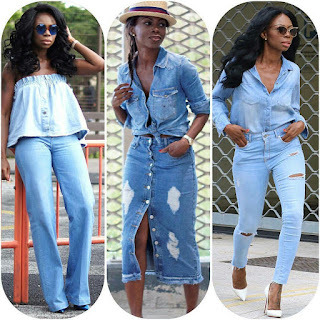 Here are three stylish ways to rock your denim on denim look, something you should try out this weekend and you'd never regret. We've so far had a couple or more post on denim, so much so that we've labelled it, and it's obvious we can't get enough of this fashion trend. 1. The first denim look is an off-shoulder denim top and a wide leg-bell bottom denim pants. Just too stylish upon beholding. Anyone capable of rocking this denim on denim look is definitely and obviously a fashionista! There is no two ways about it. This particular denim on denim look is perfect for a date with boo or a friends union over this weekend. 2. We are going a little bit Vintage with this second denim on denim look. It takes a stunt fashionista to pull off this look and slay. So get out of the box this weekend as you try to rock this ever stylish denim on denim look which is a long sleeve denim shirt rolled up to the elbow and tied at the edges just to give it that crop top look and a midi denim skirt buttoned halfway to give it a front slit look. The denim on denim look was completed with a hat. When coping this look, I advice you cop it just as exactly as you see it, especially when it comes to the hat. You might not be able to choose the right colours to match your denim on denim look, so stick to the obvious! This street style denim on denim look is preferable for a casual hangout with friends over this weekend. 3. The last but not the least denim on denim look is a long sleeve denim shirt tucked in into a distressed denim jeans and paired with a white pump heels. I bet you can pair your own look with any colour of shoes if you are coping this particular denim on denim look and you would never go wrong! But I'd prefer and recommend heel sandals over pumps or platform heels for this look.